After selling out in each of its first three years, Monster Energy Fort Rock was expanded to two days for its fourth year. 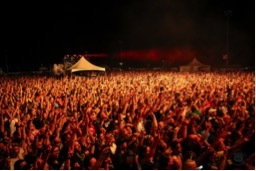 This past weekend, over 23,000 people came to JetBlue Park in Fort Myers, Florida, the spring training home of the Boston Red Sox, to participate in South Florida's Biggest Rock Festival. 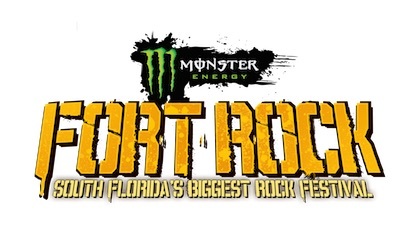 Produced by Danny Wimmer Presents and AEG Live, Fort Rock is part of the World's Loudest Month festival series that features the biggest names in rock music performing in eight distinct concert atmospheres across the country in April and May. Clay Busch, VP of Marketing and Brand Partnerships for Danny Wimmer Presents, says, "From day one, Fort Rock was designed to create a one of a kind rock and roll getaway! Thanks to all the 20,000+ fans who braved the heat and all the artists who performed, Fort Rock has claimed its position as one of the country's premier destination festivals. We can't wait 'til next year". Festivalgoers enjoyed a hot and sunny weekend chock full of performances from rock icon/filmmaker Rob Zombie, Disturbed, Shinedown, Five Finger Death Punch, A Day To Remember, Bring Me The Horizon, Megadeth, 3 Doors Down, Sixx:A.M., Lamb Of God, Ghost and more. Festival experiences included free sampling in the Monster Energy viewing deck, ice cold beer courtesy of Bud Light, a VIP viewing deck courtesy of Jack Daniel's, an f.y.e. tent full of music for sale as well as multiple artist meet and greets and autograph signings, and the brand new interactive Jägermeister Chill Zone keeping festival fans cool, comfortable and shaded all weekend. Since 1993, music industry veteran Danny Wimmer has been producing concerts and festivals, both large and small. In 2011, he formed Danny Wimmer Presents, which now produces several of the largest rock and alternative festivals in the U.S. By combining A-list talent with local cuisine and culture, DWP has become recognized within the industry for delivering the highest-quality entertainment experiences to fans, artists, sponsors, partners and host cities. DWP creates memorable and all-encompassing festival experiences, leaving both consumers and partners with lasting and meaningful impressions. 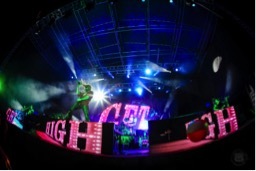 With 580,000 fans attending all DWP festivals in 2015, and 10 billion media impressions, DWP will continue to add new music festivals to its already stellar portfolio, which includes Rock On The Range, Monster Energy Aftershock Festival, Monster Energy Welcome To Rockville, Monster Energy Carolina Rebellion, Louder Than Life, and Monster Energy Rock Allegiance among others.